Below we have an interactive guide and map of Fuengirola for visitors and tourists visiting the sprawling town of Fuengirola on the Costa del Sol coast of Spain. This free Google map of Fuengirola can be used in many ways: as a streetmap of Fuengirola, as a map of Fuengirola hotels, as an Fuengirola apartment map, as a way of getting driving directions to Fuengirola or as a map showing the main tourist attractions and sights in Fuengirola. Where is Fuengirola located in Spain? What is the nearest airport to Fuengirola? How do I get to Fuengirola? Where can I find driving directions to Fuengirola? Where can I find a free streetmap of Fuengirola? Where can I get a hotel map of Fuengirola? Using the buttons on the top left you can ‘zoom’ and ‘pan’ and take an interactive virtual tour of Fuengirola watching the panoramic images and pictures of the sights and attractions of Fuengirola. You can also choose the point you want to have in the centre of the map by double clicking. Fuengirola is very much a massive, sprawling high rise tourist resort located on the popular Costa del Sol coast of Spain. In size Fuengirola can be compared in size and popularity to Torremolinos and Benalmadena both also on the Costa del Sol and Benidorm on the Costa Blanca coast of Spain. 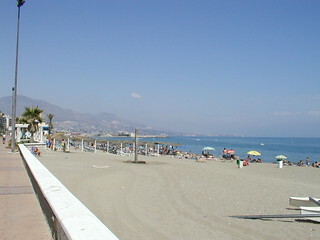 Down the Costa del Sol coast from Fuengirola is Las Lagunas, Don Alberto, Playa de la Campana, Punta de Calaburra, Calaburra, Residencial Hipodromo, El Faro, El Chaparral, Jaramar and Mijas Costa. Up the Costa del Sol from Fuengirola there is Santa Fe de los Boliches, Torreblanca, Torremar, Cabena, Carvajal, Mi Jardin and Torre de Benalmadena before Benalmadena itself. Surrounding Fuengirola there is Parque del Sol, Castillo Sohail, Las Lagunas, Parque Villalobus, Urbanisation Jardines del Aguila, Cerrado del Aguila golf, Santana golf and country club, La Cala golf, Mijas golf, Naranjas golf, La Cala resort, Puebla Aida, Las Acacias, Campo Mijas, Las Yucas, San Francisco, Colina Blanca and Los Olivos. This interactive Google Fuengirola map and guide is best used as a tourist information guide as it shows some of the best sights, attractions, tourist spots, famous landmarks and places of interest in Fuengirola. Alternatively you can use the Fuengirola map as a street map to help you with driving directions and travel information, to and from Fuengirola. You can use it from your place of origin such as Malaga Airport. 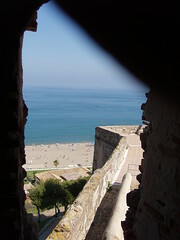 It will help you get to Fuengirola and also help you get around Fuengirola when you are here on your trip or holiday. On the map of Fuengirola we have placed markers showing the locations of Fuengirola’s best-known tourist attractions and sights. These markers and pins show the locations of the famous buildings, museums, galleries, parks, beaches, golf courses, major sights of interest, tourist offices, markets, hotels, apartments and restaurants within Fuengirola. Use the interactive map to show you where your accommodation is situated for your stay in Fuengirola. You can find all the hotels, apartments, villas, guesthouses, hostels, pensions and camping sites that are in the Fuengirola area. You can change the street and road map view to a view of the terrain of Fuengirola or you can choose a Google Earth satellite view of Fuengirola which shows you actual images of Fuengirola from the sky above. Fuengirola Map Page Summary – Visitors to Fuengirola can use the map above in conjunction with our tourist information pages to learn and find out what to do, where to go, how to travel and get around, what to see and do in Fuengirola. Explore Fuengirola and discover many of the hidden places within the town or use the map for planning trips and excursions outside of Fuengirola.